I get lots of folk who are doing Weight Watchers often saying that they struggle to find low pro point, filling but tasty lunches. As you all probably know, I’m a huge salad fan and this is one of the regulars in my repertoire. As it’s so filling, it usually stops me fancying an afternoon snack later on in the day! I use Aldi’s cous cous as it’s the tastiest one I have had and is only 39p per pack (each pack does two lunches too!). I vary the flavours between the spicy and the lemon and coriander but both work nicely with the recipe below. I usually make two portions in one go so I don’t have to be organised two days in a row. Meanwhile chops all vegetables and pop in a large bowl. Add the balsamic and red cabbage. Once cous cous is cooked add to the bowl. 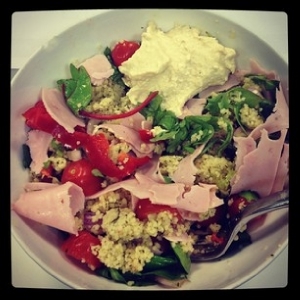 Rip up your wafer thin ham into smallish sized pieces and scatter over cous cous and salad mix. Pop into a bowl and top with the houmous (or toss through). Season with salt and pepper and a squirt of lemon if you fancy!